Customers on our Premium subscription, can create ‘Divisions’ in Vinsight to enable separate reporting and tracking of those parts of their business run as separate legal or operational entities. Having ‘Divisions’ also allows for separate Xero connections to separate Xero accounts. To create separate divisions, you need to contact Vinsight Support. 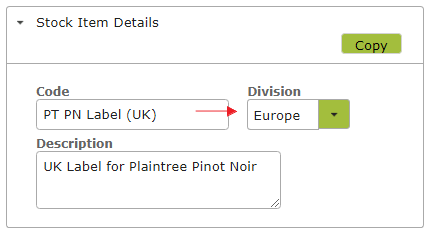 When creating Sales or Purchase Orders, select the relevant division from the Division drop down list. This will ensure all purchase and sales reporting can be broken down by division. It will also ensure that, if running separate Xero accounts, the sales get posted to the right account. Similarly you have the option of assigning a Stock Item to a particular division. This will ensure that Stock reporting, such as ‘Stock on Hand’ reports can also be broken down by division. You can select one, all or some other subset of divisions before running the report.